Many non-Muslims have no idea that Muslims worship the same God as Christians and Jews, and that Islam preaches compassion, charity, humility, and the brotherhood of man. And the similarities don’t end there. According to Islamic teaching, Muhammad founded Islam in 610 CE after the angel Gabriel appeared to him at Mecca and told him that God had entered him among the ranks of such great biblical prophets as Abraham, Moses, and Christ. Professor Malcolm Clark taught in the Department of Religion at Butler University for 30 years. Part I: Understanding the Basics. Chapter 2: Tracing the Path of Islamic History. Chapter 3: Submitting to God. 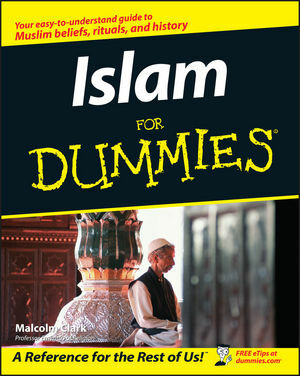 Chapter 4: What Muslims Believe. Chapter 5: Standing Before God: Heaven and Hell. Part II: Muhammad: The Man, the Book, and Rules of Law. Chapter 6: The Prophet: Muhammad. Chapter 7: The Book: The Qur’an. Chapter 8: Islamic Tradition and Law. Part III: Becoming Familiar with Muslim Daily Life. Chapter 9: The Five Pillars of Worship: Foundations of Islam. Chapter 10: Observing Other Religious Rituals and Customs. Chapter 11: Muslim Ethics: Living the Good Life. Part IV: Recognizing That All Muslims Aren’t the Same. Chapter 14: Exploring Lesser-Known Sects Linked to Islam. Chapter 15: Islam in America. Part V: Considering Islam’s Concept of Abrahamic Religions. Chapter 16: Seeking Common Roots: Abrahamic Religion and Beyond. Chapter 17: Seeking Common Ground. Chapter 18: Meeting the Challenge of Modernity. Chapter 19: Ten Muslim Contributions to World Civilization. Chapter 20: Ten Noteworthy Muslims, Past and Present. Chapter 21: Ten Islamic Regions in the News Today. Appendix A: Counting the Years: The Muslim Calendar. Appendix C: Resources: Digging Deeper.